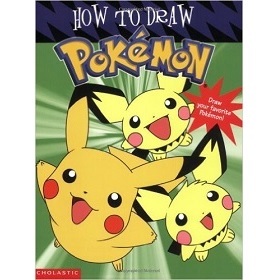 How to Draw Pokemon is a book in the Children genre written by Tracey West. The book was published by Scholastic Paperbacks on 2003-06-01 and contains 32 pages. The book has an ISBN number of 978-0439434409. Our users found the overall impression of this book to be Educational. Every afternoon for the past few years my little one has watched Pokemon. He loves drawing so I thought I would get him a book that combined his two passions. Even though pikachu (and i think pichu) are on the cover, the book actually shows how to draw well over 10 pokemon. At first my son had some difficulty drawing the basic shapes required for the creatures but after several weeks practicing his drawings have become much better. Overall, as long as your child is willing to put in the effort, they can become a pokemon drawing master :).